Yes, that’s right. I’ve got bad news for you, provided you do or have or will live and bird and list in North America. But sit down first. 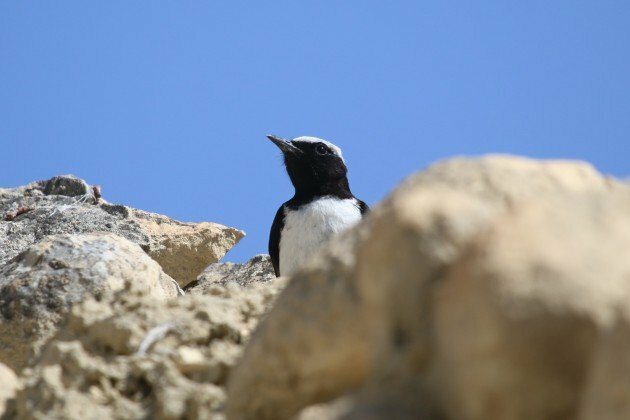 Before we turn our attention to your various bird lists, let me tell you a story about some wheatears of the genus Oenanthe that are found in Kazakhstan’s Mangghystau province. A variety of wheatears occur there, in fact, such as the beautiful Finsch’s Wheatear. However, this post is not about Finsch’s Wheatears, although they look pretty close to the one that is of relevance to your life list. The species you will shake your fist at after reading this post is the Pied Wheatear Oenanthe pleschanka. This handsome little bird has a wide distribution, roaming from north of the Black Sea over central Asia and way, way into China and Mongolia. 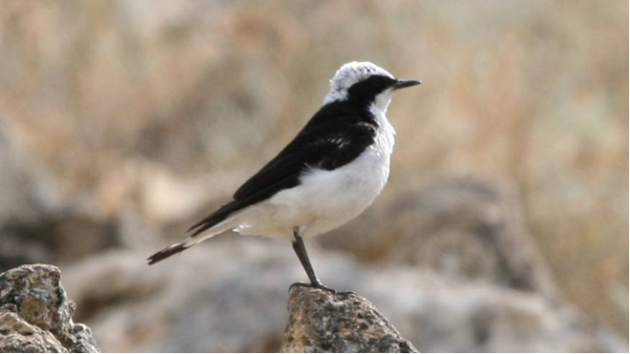 Throughout its range, Pied Wheatears are supposed to essentially look like Finsch’s Wheatears – pictured above – except for their backs which should be entirely black, leaving just a pale whitish nape and cap. Now, if your knowledge on birds reaches beyond a KFC bucket, you will be aware that things never look the way they should and are not what they seem. There’s more to the Pied Wheatear than a black back and throat. The species has [drum roll] a mysterious morph that’s funny in a peculiar way and largely restricted to the southwest of Kazakhstan. Some males – and females too, but that’s much more complicated – have a white throat, leaving the head with just a dark mask, and these individuals are classified as the “vittata”-morph. And here’s the kicker finish to this paragraph: this “vittata”-morph is not just a conventional morph, as in the Skuas/Jaegers, the Screech-Owls or Cuculus – cuckoos. It is the result of ancient hybridisation with another species of Wheatear occurring to the West of O. pleschanka: the Eastern Black-eared Wheatear. 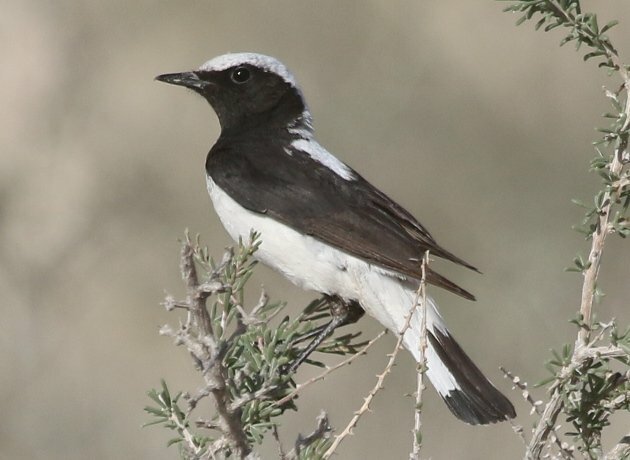 The fact that this hybridisation event is ancient and no pure Eastern Black-eared Wheatears occur in Kazakhstan today means that – as a logic consequence – the species was removed from the Kazakhstan bird list by Arend Wassink, who runs the excellent website The Birds of Kazakhstan. The scientific me has no problem with this. However, the birding me does, because the birding me likes to assign individuals to species and put them on a silly list to compete with other equally nerdy inclined birders. And the circumstance that a bunch of ancient Easten Black-eared Wheatear genes diffuse freely through a population of Pied Wheatears means that occasionally, and not so rarely, they accidentally congegate in an individual which turns out to look quite like the ancient intruder and not so much like a Pied Wheatear. Below is a comparison between a pure Eastern Black-eared Wheatear on the left [a picture I’ve gleaned from wikipedia on the grounds of it being included there under a creative commons license, and which was taken by Mark S Jobling], such a hybrid in the centre, and a pure Pied Wheatear on the right. Even a casual glance at the image above will reveal just why I struggle to label the central bird as just a morph of the Pied Wheatear, and not as an Eastern Black-eared. It just feels bizarre to do so, and doesn’t seem to do the real genetic situation justice. Okay, the central bird still and clearly is not a pure Eastern Black-ear. It is indeed an definitely a hybrid. But come on, this is so close a match that anyone would be forgiven for putting such a bird on their list as an Eastern Black-eared, or not? And this is what I’ve done. Yes, there: I said it! I have added Eastern Black-eared Wheatear to my year list based on some hybrids I saw in Kazakhstan. Oh, there is no need to shout – I can hear you clearly and the words “cheating”, “foul play” and “betrayal” as well as “disqualification from the year list competition” are difficult to misunderstand. But let me tell you another story. In a small town named Albion, in the south of Wisconsin, there is a small cemetary where a man is buried that you may know well. You may not have met him in person as he died in 1888, yet you have likely met one of the footsteps he left behind. And footsteps he left quite a few, as this Swedish-American ornithologist, naturalist and taxidermist was one of the foremost ornithological pioneers of his time, and he was particularly reknown as possibly the leading expert on the identification of birds’ nests. His name was Thure Ludwig Theodor Kumlien. The one of Kumlien’s Gull fame. And isn’t the Kumlien’s Gull an interesting species? Oh wait, it isn’t! Once considered a subspecies of Iceland Gull, it is now known to be nothing more than a hybrid between the white-winged Iceland Gull and the black-patterned Thayer’s Gull. And this is where your lists hit the fan: what was that bird again you put on your year/life/whatever list as “Iceland Gull”? And that Thayer’s you saw, the lifer one, remember? It did have quite a restricted amount of black in its wing tip, right? Well, well. What an awkward situation. Don’t worry. Even though you spoke hastily and in a low, whispering voice, I clearly understood your “Fair enough, go count your wheatear then and be quiet, will you!?”. Here’s another wicket “vittata” for you. And nevermind the turmoil.